The Most Imported Thing is seo in blogging.adding the right robot.txt file is key to success. 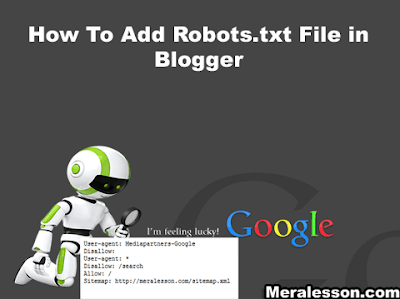 if you add your robot.txt file in right way your blog surely increase your seo rank and traffic in this tutorial you will learn how to add the right robot.txt file in blogger blog. Now Copy below Codes and paste it to in your robot.txt box and save it . Note: replace meralesson.com with your blog address. Some basic information about Robot.txt file codes. The User-agent: means the search engines like google,bing,etc. The * sign is used for all search engines robots.